Man arrested at Harvest Festival in Vero Beach after offering alcohol to a teenage girl. VERO BEACH – A 23-year-old man was arrested after trying to give a 13-year-old girl alcohol Friday night at the Harvest Festival. 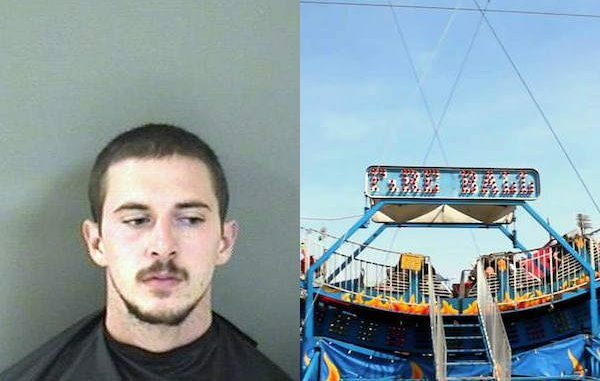 Evan Raymond Morris, of Vero Beach, approached a teenage girl while she was in line at the “Fire Ball” ride at the fair. Morris, who was visibly intoxicated, offered the girl alcohol from a “Sunny D” juice bottle he was carrying. This upset the girl, who told her father. The father called the police to report Morris. Vero Beach police arrested Morris on a charge of Disorderly Intoxication. He was transported to the Indian River County Jail where he was later released on a $500.00 bond.